The container for the clay mass can be filled with a whole 12.5 kg of blank clay. By a slight, downward movement of the ratchet lever, the clay is pressed through an individually selected template on the bottom of the container. Depending on the shape of the template, hollow round, rectangular or octagonal clay strands are produced. 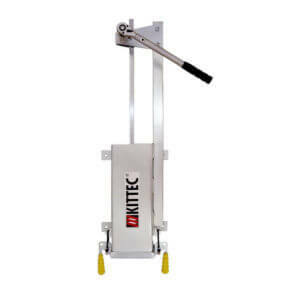 The KITTEC ® Clay Press TP can be mounted on sturdy concrete, wood or brick walls. As an option, however, we also offer a special frame, which only has to be fixed to the floor. Extra-large cylinder for a complete clay blank! Developed jointly with specialist retailers!